This DIY laptop case helped me get the last life out of some old clothing and a ruined duffle bag. Why make my own laptop case? I wanted to keep my fancy new MacBook from getting scratched while I carried it on short trips. But I didn't want a big case that added too much weight and bulk. I wanted to keep things as minimal as possible. I came up with the pictured solution for a DIY laptop case. It uses stretchy cotton-spandex fabric from an unwanted piece of clothing for the main body of the bag. Straps from an old ripped duffle bag provide support and structure. I also added a spare shoulder strap in case I wanted to get mobile. The shoulder strap attaches to the bag by clips, so I can still use it with its intended piece of luggage. Finally, I used some spare velcro to make a secure closure for the bag. I used an old soft shirt for the case material and two straps from an old duffle for support. Want to make your own laptop case? It's not that hard, and if you're looking for a way to re-use old items that you're otherwise ready to toss, this is a good project. Make sure you have enough fabric to cover your laptop. Check by roughly covering the laptop with it as if you were wrapping a gift. Cut the fabric to size, leaving about 2 inches of extra material on all sides for your hems. If the fabric is thin, stretchy, or not very sturdy, sew on two or three supporting straps as pictured. Decide which edge of the case will be the opening. Hem that edge by folding a 1/4 inch of the fabric over twice and sewing it flat. This will protect the raw cut edge of the fabric from unravelling. Now turn the fabric *inside out* and wrap it around your laptop. Use pins to mark where you want the seams to be. 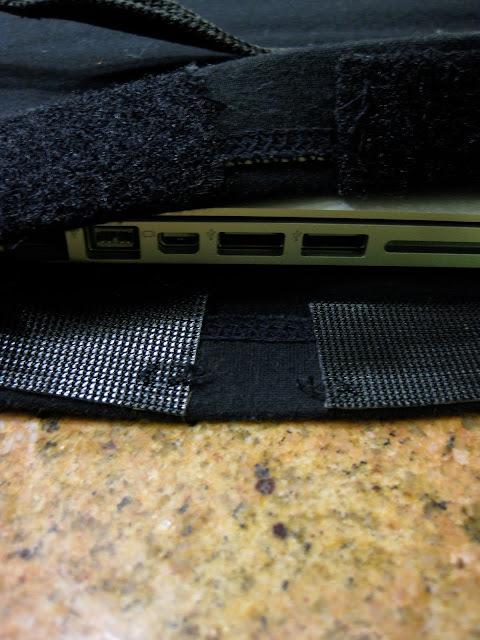 Use a sewing machine to go over the pin-marked seams while the case is still inside out. Turn the case right side in. Ta-da! Determine your preferred approach for closing the case. Velcro worked for me! I used leftover velcro from other items as my case closure mechanism. If you're interested in checking out a more elaborate DIY laptop case, I made an awesome Monster-themed one, posted here: http://www.bakergal.com/2010/02/monster-laptop-case.html.